For high-end computing applications like gaming, HD media playback, or creative software, WD Blue solid state drives have the speed you need for the performance you want. Tiered caching technology utilizes SLC (single-level cell) and TLC (triple-level cell) flash technology to enable sequential read speeds of up to 545MB/s and sequential write speeds of up to 525MB/s, allowing for fast system boot up, quick application response, and rapid transfer speeds. With no moving parts, a solid state drive is designed to help protect against data loss if a drive is accidentally bumped or dropped. And with 1.75M hours MTTF (mean time to failure) and an endurance rating of up to 400 TBW (terabytes written), WD Blue SSDs can help guard data for years to come. WD Blue solid state drives also use several leading error-correction technologies to help prevent data loss and provide lasting reliability. 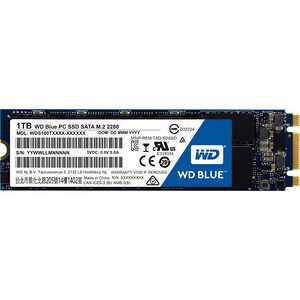 WD Blue SSDs are available in either a 2.5"/7mm cased or an M.2 2280 model to evolve with smaller and thinner computers. With form factors to accommodate most laptops, desktop PCs, and small form PCs, a WD Blue SSD is ready for the job. Every WD Blue SSD goes through extensive compatibility and reliability testing to ensure it meets the highest standards of the WD brand. With a certification from the WD Functional Integrity Testing Lab (FIT Lab™), every WD Blue SSD is verified for compatibility with a wide range of desktop and laptop computers. The downloadable WD SSD Dashboard provides a suite of tools so you're always able to check on the health of your solid state drive. Available for free, this Dashboard helps you track things such as disk model, firmware version, S.M.A.R.T. attributes, or simply monitor how much space you have left on your WD Blue SSD.